Leaving has always come naturally to Eva Elliott: the daughter of a pilot, she spent her childhood abandoning schools and cities. Now an adult, she enjoys the thrill of saying goodbye much more than the butterflies of a first smile or kiss. There’s so much more potential in walking away, and Eva has always had a dangerously vivid imagination. There is no questioning Anna Stothard's ability to create vivid, hypnotic descriptions. 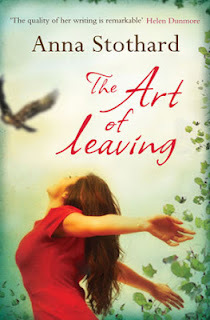 The Art of Leaving has a very cinematic tone (which, considering that Stothard studied at the American Film Institute, isn't surprising), and I enjoyed the ways in which different parts of the world are illustrated. This is done in a very unique and prolific way, and the locations prove to be a very intricate part of the plot. Although the narrative of the story is told with established warmth and skill, I don't have much praise for the story's lead character, Eva. She is very anti-social, numb, and goes through life in a daze. It is important to note, though, that these aspects of her character are very important to the story – I got the impression that you're supposed to feel these things about her. The fact that she isn't a very grounded character prompts her continued desire to leave people, and places, behind. Even so, I would have preferred The Art of Leaving if Eva was more likable, and if the plot were more apparent (I struggled to see where it was going at times). It was the mesmerising elements of Stothard's use of language which propelled me to read on. I would recommend The Art of Leaving to readers who don't mind a loose, offbeat plot, and picturesque narratives.